The Crape Myrtle Bark Scale is an introduced pest that has made its way into the Dallas, Texas area, the Shreveport/Bossier area and a few other cities in Louisiana and Arkansas. Information, pictures and management recommendations are provided in this fact sheet. 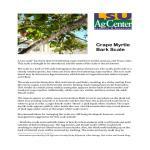 A new scale (Information provided by LSU AgCenter Faculty Ricky Kilpatrick, Allen Owings, Dale Pollet and Dennis Ring) has been observed infesting crape myrtles in north Louisiana and Texas cities. This scale is thought to be introduced, and the name of the scale is not yet known. The scale is a bark or felt scale belonging in the genus Eriococcus. The azalea bark scale is a closely related species, but it has not been observed infesting crape myrtles. The new scale insect may be Eriococcus lagerostroemia, which feeds on Lagerostroemia indica in Japan and China. The scale excretes honeydew that coats leaves and limbs, resulting in a sticky coating from the excess sugars excreted from the insects’ feeding. Sooty mold grows on the honeydew. This results in a black (sooty mold) coating that appears on the bark of the branches and trunks of crape myrtles. Additionally, white cases are visible, and they enclose the adult female scales. The insects appear as white, waxy encrustations likely to occur anywhere on the plant but often near pruning wounds or in branch crotches. Up close, the azalea bark scale insect is white to gray in color. Larger female scales "bleed" a pink liquid when crushed. The crape myrtle scale appears pink in color inside the case. Careful examination may reveal dozens of pink eggs under some of the larger white scale covers. Wash the trunk and reachable limbs of heavily infested plants with a soft brush and mild solution of dishwashing soap. The egg masses and female scales will be washed off, resulting in improved effectiveness of insecticides. Also, the black mold building up on the bark of infested trees will be removed by washing. The scales and sooty mold may be removed by using water pressure. Removing the loose bark is important because the protected areas where the scales hide are removed. This removes the areas that the scales may use for protection from unfavorable weather in winter. Management of this insect has not been shown using horticultural oil. Applications of dormant oil in the winter may reduce the numbers of these scales. It is very important to thoroughly cover the tree. Applications of systemic insecticides may be made to the plant root zone. One application should be made between May and July. Systemic insecticides include dinotefuran (Greenlight Tree and Shrub Insect Control with Safari) and imidacloprid (Merit or Bayer Advanced Garden Tree and Shrub Insect Control). Allow several weeks for these insecticides to work because they must spread through the plant. Time insecticide applications by examining the cases containing the scale eggs to determine when the nymphs emerge from the eggs. The time that the nymphs emerge depends on weather conditions and plant locations. Infested branches may be treated with applications to the terminals using Orthene (acephate) or Merit (imidaclorpid) in a slurry (4-to-1 ratio of wettable powders to water). Such applications have been effective in controlling aphids by painting the trunk of the tree with a 6-inch-wide band. Wipe clean the terminals or areas of branches above the infestation. Apply the slurry around the branches or terminals about 6 inches wide. The phloem tissue directly takes up the insecticide, and the materials move through the plant. Additional work on management of this insect is needed. The crape myrtle bark scale has been found in North Texas – in the Dallas area – and in north Louisiana – in the Shreveport area. If you find this scale, please take a sample to the county agricultural agent. Note: Invasive species sneak into the United States in many ways. Then they spread initially undetected through agricultural crops because plants are not carefully checked before purchase or watched after planting until infestations expand and result in unsightly plantings in the landscape or field. All plants should be carefully examined before purchase and after planting to reduce the potential for invasive species becoming established in our nurseries, cities and yards. When unusual insects or injuries occur, notify your local agricultural agent immediately. This information is made available by Ricky Kilpatrick, area agent in forestry. If you are unable to download the attached file, please contact the Bossier Parish Extension office at 318-965-2326. To view the PDF, click here.